Set during the events of the upcoming third game in the real-time strategy video game series, which sees the Space Marines, Eldar, and Orks battle over a newly discovered superweapon, Titan’s Dawn of War series—from Ryan O’Sullivan, Daniel Indro, and Kevin Enhart—will follow two Space Marine Sergeants as they journey to find one of their own: missing chapter master of the Blood Ravens, Gabriel Angelos, a major player in the events of the first two games. 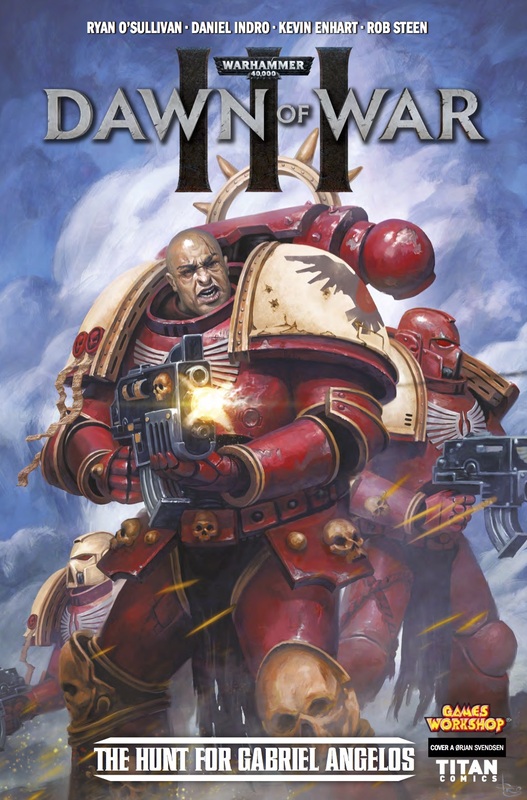 Before this issue, I had only ever read one other Warhammer comic – Eisenhorn: Xenos, also written by Ryan O’Sullivan. I enjoyed that issue and really immersed myself into the world. I’m not totally new to Warhammer, I have friends and family who play it, and I am aware of the world and characters within in. I think new readers would easily get into these stories. It’s an interesting beginning, and we then get the search beginning. The style of the story is excellent. The art captures some of the action scenes really well, with some amazing battles, and some nice work with the ships. This combined with some of the panel timing make this a really good read, there are some real moments of suspense, with rockets, attacks and some really interesting side glances. As a first issue, this is a good primer, we’ve got the main mystery, and we now know there is another mystery – but I can’t help thinking there is more to find out. Add into that, the Orcs and the warzone, and we’ve got an issue #2 to really look forward to! An excellent read all round!